Ashish has designed his eighth collection for Topshop and fittingly for this summer, it has a sportswear theme. At work we have done numerous features about how you are banned from saying O-L-Y-M-P-I-C-S – just in case your cornershop window is mistaken for an official sponsor, or your decorative Primark thong is confused with an official branded product. Even sticking those rings up there is probably going to get me arrested, but I like to live life on the edge when it comes to CIRCLES THAT MAY OR MAY NOT MEAN ANYTHING. His brand of witty slogan-bedecked jersey is a perfect match for ANY SPORTING ACTIVITY THAT MIGHT BE HAPPENING IN 2012 – following on from the skiwear lols that we all enjoyed so much last year and the Frenchy funtimes from the year before that. This time around it’s SPORT NOT SPECIFICALLY THE OLYMPICS JUST SPORT that gets the wordplay treatment – not so many actual puns this time around, but still some well-chosen words for those of that don’t take SPORTING ACTIVITIES OF ANY NATURE particularly seriously. Perfect gym gear, right here. 4) Nike x Liberty Blazer Mid, £74.99 – fine these aren’t Topshop, but they fit. What’s particularly awesome is that adidas are official partners of the games, not Nike. OOPS. 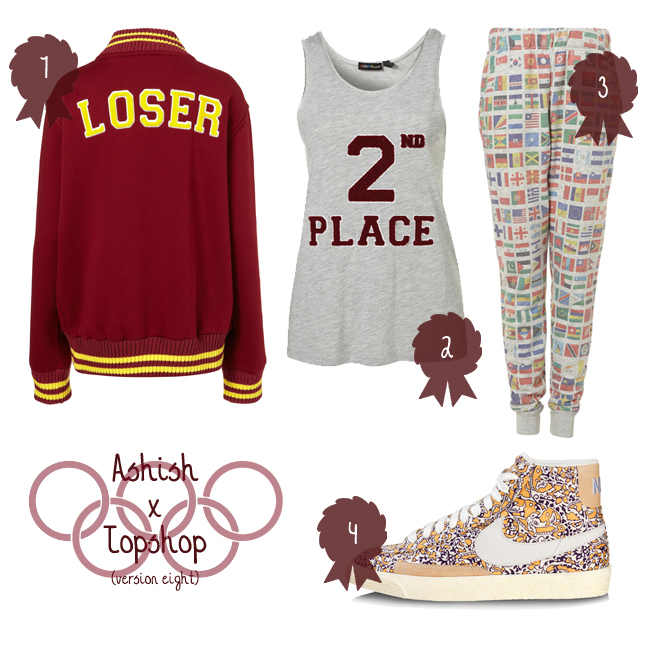 I want the Loser jacket so, so, so much. Lolympics, more like, amirite? !